Keeping on top of compliance in your business may not be one of the most exciting aspects of managing your company, but believe me when I say that it’s one of the most important. And in my experience, it’s something that business owners often overlook. It’s not uncommon for people to have the mentality of, ‘that could never happen to me’, and therefore they don’t have a healthy attitude towards compliance. The reality is that you need to have all your bases covered because, in the unlikely case of the worst happening, you want to make sure that you’re prepared. As I often say, you need to have contingencies in place, and you need to prepare for the best-case scenarios and also the worst-case scenarios. 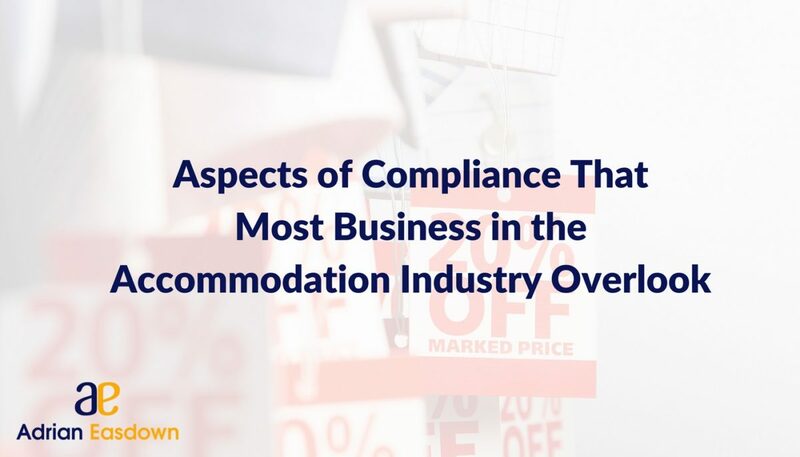 In this article, I’m going to be sharing with you a few instances of compliance that I’ve learned have to be addressed in the accommodation industry, but that most businesses overlook entirely. This first one’s all about the electrical appliances in your accommodation business. Of course, as the business owner you’re in charge of the health and safety of your guests, so you need to make sure that everything’s working well. Anything that plugs into a wall needs to be tested by a competent professional; for instance, a qualified electrician. Normally this means bringing in a contractor to do tag and testing work, although if you have someone in your team who’s qualified and can do the work, then it’s the best of both worlds. Just make sure you have a schedule for tag and testing, and that you’re on top of it. Because if you’re not, then the repercussions for the business owner and the company directors would be significant compared to the effort of having it done. Every business has top assets that they rely on week in week out. These are the things that really pull clients towards your business. I talked about their importance and how you can use them to target your ideal client in a recent article, but here I just want to focus on the importance of maintaining them. One of our prize assets, for instance, is our pool. It’s a key attraction in our park, and is vital for keeping the guests happy. So you can imagine how bad it would be if we had to shut it down for one reason or another. That’s why we check it on a regular basis to make sure that it’s up to industry standards. This doesn’t just mean keeping it clean, but actually knowing the ins and outs of what the industry standards are! Make sure that you know exactly what’s required of you to keep your top assets in shape, and make keeping on top of those standards a high-priority for you and your team. This is a big one, and probably where I learned the most lessons in my experience with compliance in the accommodation industry. It’s vital that you have robust plans in place for any emergency that may happen. Potential emergencies will, of course, depend on your type of accommodation business and its location, so do your research into what hazards there are. The best and most efficient way to do this is to speak to your local emergency services department. They’ll have a good idea of what could happen in a worst-case scenario, and how you need to prepare for it. You should organise annual drills (something that almost all accommodation businesses overlook) to make sure that your team are well-prepared and that you’re comfortable knowing you can handle any eventuality that’s thrown at you. Many of the aspects around keeping on top of compliance of course come down to common sense. But it’s easy to overlook and forget about certain things when you’re running a busy business. On a day to day basis, things are unlikely to go wrong, but if they do they could have a seriously negative impact on your company. So don’t fall into the trap that many accommodation businesses do, and always be well-prepared. Because if you’re not, you could pay the ultimate price. This really is a case of ‘better to be safe than sorry’, and you shouldn’t let anything get in the way of your clients’ well-being and your own peace of mind.